Sai Homestay Bed and Breakfast (near Taj Mahal) i Agra, India: Bestill nå! Your host are Mrs Simi n Rajiv Sethi basically from Punjab as you must be aware of, that Punjabis are well known for tasty food n hospitality ,they just love to eat and enjoy, that guarantees a friendly courteous service, where Punjabi hospitality is assured to make your visit to the City of Love a pleasant, memorable and enjoyable experience. Well-maintained, welcoming accommodation with warm, attentive service, a 10 - 15 minute walk from one of the world's most beautiful building Taj Mahal , Agra 's emblematic Red Fort and Agra Fort rail station and the city centre are approximately 3 kilometres . 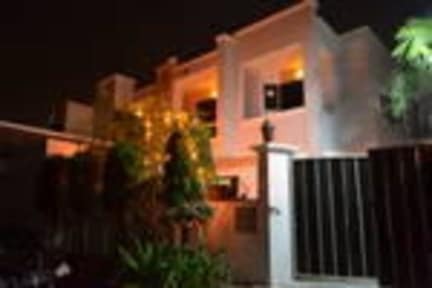 Sai Home Stay Bed and Breakfast is set in the trendy posh peaceful area of Sai Puram adjoining Vibhav Nagar near Fathebad Road a Travellers & shopper's paradise, with its numerous restaurants, pizzerias, cafes, star hotel , restaurants, bars, designer shops and fashion boutiques that cater for all tastes within the immediate vicinity (Walking distance). As well as 24 hour cash dispensing banks and currency exchange bureaus, the immediate area is also served by an international cinema, various supermarkets, internet and international telephone points, and various shops that provide all the services imaginable to cater for your every need and requirements to make your stay a pleasant enjoyable hassle free experience. Newly built and opened by the grace and blessings of our beloved Lord Sai Baba.